I’ve written about Facebook precise interest targeting before – about how granular we can get by targeting our competitor’s customers, people who’ve liked certain brands even people who have mentioned specific topics in their status updates or comments. The ad targeting precision is unbelievable, it’s a testament to how much valuable personal and demographic data Facebook has collected. The precision of Facebook ads continues to get better and there’s still lots of room for improvement. 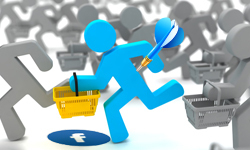 In this blog I am going to focus on using different parameters within the Facebook Ads interface to get an even higher level of precision than simply targeting people who like a specific topic. The product, automotive-related and is geared towards higher-income men between the ages of 30-60. A single sale of the product brings $10,000+ in revenue, therefor a higher cost per conversion is justified. This required some intuition and creative thinking; we hypothesized that our customer is likely to drive a luxury car. Great, so we had one precise interest nailed down. 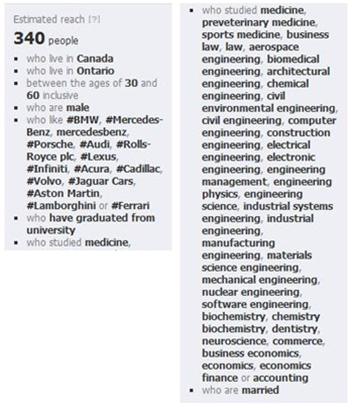 We entered all the usual suspects into the Facebook Ads interface: BMW, Mercedes, Porsche, etc. 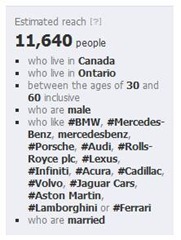 We found that there were 11,640 married men who liked any one of the luxury car brands below. Bidding on these people is a good start, we’ve taken steps to weed out people who may just like BMW, Mercedes, etc., by selecting the age range of 30-60 and by restricting this niche to married men. But this is still no guarantee that these people own or would be able to afford one or more of these luxury cars. Let’s take a different approach to targeting married men between the ages of 30-60 who are in the upper-income bracket. Facebook Ads also allow you to target people based on their education. You can aim for people who graduated from specific universities or you can target people who hold specific degrees. For our purposes we chose to target people with degrees that were likely to earn them a high income. We chose degrees like medicine, law, engineering, etc. This is great information, we know these men probably make a lot of money, they’re married and they fit our target age group, but it’s no guarantee that they would be interested in our automotive product (even though they’ll likely be able to afford it). What would happen if we combined the two groups and found the overlap of highly-educated married men between the ages of 30-60 who liked luxury car brands? A higher bid-price for this target group could be justified, especially given that one sale could bring in $10,000+ in revenue. A higher bid-price would result in increased frequency of the ad being shown. This is a limited target-group, but it’s still one that’s worth spending on. Granted if this group was nation-wide you would see an even greater impact on having a highly-targeted overlap of potential customers. Again, this prevents ad spend that’s wasted on people who aren’t likely to purchase the product. 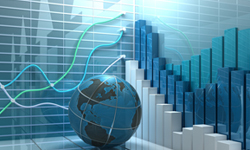 There are infinite overlapping demographic and psychographic parameters that you can target. Perhaps men who own luxury cars would be more likely to read Road and Track rather than like the Facebook page of their favourite luxury car brand. It might also be favourable to target readers of The Economist if you want to target high-income earners. The possibilities are endless and I would encourage you to try multiple overlaps of demographic and psychographic factors and interests in your pursuit of targeting your ideal customer. Hey Steve! I have searched all over the place and I cannot find an answer to this question. 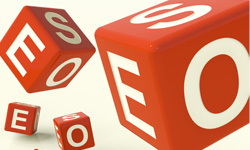 What causes some keywords/page titles to show up in the precise interest targeting and others do not? Hi Michelle, Great question! There is no official answer from Facebook, but allow me to share some of my own insights. 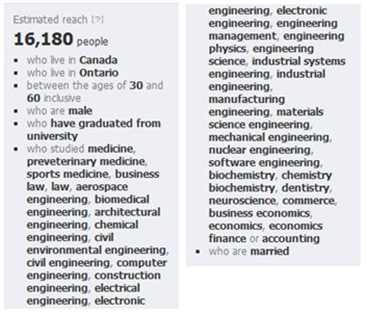 Precise interests will show when there is a significant mass of people talking about those terms/pages. This may change depending on what geographic area, age group, gender, etc. you target. For example, if I want to use the precise interest “hockey” and I’m targeting people in Cuba, then the precise interest isn’t likely to display because there are not enough people in Cuba who like hockey; but if I’m targeting Canadians then the precise interest will show because there is a significant number of people who like or have talked about hockey.